DAVID GRATZER, a licensed physician in the US and Canada, is a senior fellow at the Manhattan Institute. His research interests include Medicare and Medicaid, drug reimportation, and FDA reform. Nobel laureate Milton Friedman authored the foreword to Dr. Gratzer’s newest book, referring to him as “a natural-born economist.” In The Cure: How Capitalism Can Save American Health Care (Encounter Books, October 2006), Dr. Gratzer offers a detailed overview of American health care and makes the case that it’s possible to reduce health expenses, insure millions more, and improve quality of care without growing government or raising taxes. Dr. Gratzer is the author of Code Blue: Reviving Canada’s Health Care System (ECW Press, 1999) and is the editor of Better Medicine (ECW Press, 2002), a collection of essays from leading health care thinkers in North America and Europe. He is often quoted across North America and is frequently invited to speak on health reform. He has debated Congressman Gil Gutknecht on drug reimportation at the American Enterprise Institute, has testified before Congress on the Health Care Choice Act, and has keynoted the Long Island Health Care Summit after Senator Hillary Clinton cancelled because of a scheduling conflict. Dr. Gratzer has written for more than a dozen newspapers and magazines and is a peer reviewer for numerous publications and organizations. Drawing on personal experience in both the Canadian and U.S. systems, Dr. Gratzer shows how paternalistic government involvement in the health care system has multiplied inefficiencies, discouraged innovation, and punished patients. The Cure offers a detailed and practical approach to putting individuals back in charge. 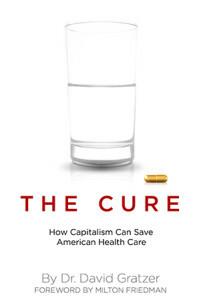 With an introduction by Milton Friedman, The Cure will be required reading for anyone who wants to know what is really wrong with the modern health care system.